Click here to schedule online! Kessler EyeCare offer pediatric eye exams in Wichita. Our vision exams for children are the best way to determine the eye health consition of your child's eyes and give them the right treatment that they need. Eye exams for children are extremely important. Experts say 5 to 10% of pre-schoolers and 25% of school-aged children have vision problems. Early identification of a child's vision problem is crucial because, if left untreated, some childhood vision problems can cause permanent vision loss. Watch a short, informative video on kid's vision now. For school-aged children, the AOA recommends an eye exam every two years if no vision correction is required. Children who need eyeglasses or contact lenses should be examined annually or according to their eye doctor's recommendations. Scheduling your Wichita pediatric eye exam at our offices is easy. Just call our optometry and our friendly staff will be happy to schedule your child's eye exam at a convenient time. When scheduling your wichita pediatric eye exam, choose a time when your child is usually alert and happy. 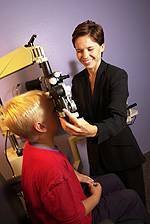 Specifics of how eye exams are conducted depend on your child's age, but an exam generally will involve a case history, vision testing, determination of whether eyeglasses are needed, testing of eye alignment, an eye health examination and a consultation with you regarding the findings. After you've made the appointment, you may be sent a case history form by mail, or you may be given one when you check in at the doctor's office. The case history form will ask about your child's birth history (also called perinatal history), such as birth weight and whether or not the child was full-term. Your eye doctor also may ask whether complications occurred during the pregnancy or delivery. The form will also inquire about your child's medical history, including current medications and past or present allergies. Your eye doctor will also want to know about previous ocular diagnoses and treatments involving your child, such as possible surgeries and glasses or contact lens wear. Be sure you inform your eye doctor if there is a family history of eye problems requiring vision correction, such as nearsightedness or farsightedness, misaligned eyes (strabismus) or amblyopia ("lazy eye"). "Fixate and follow" testing determines whether your baby can fixate on an object (such as a light) and follow it as it moves. Infants should be able to perform this task quite well by the time they are 3 months old. Amblyopia. Also commonly called "lazy eye," this is decreased vision in one or both eyes despite the absence of any eye health problem or damage. Common causes of amblyopia include strabismus (see below) and a significant difference in the refractive errors of the two eyes. Treatment of amblyopia may include patching the dominant eye to strengthen the weaker eye. Watch a short, informative video on kid's vision. Read more about pediatric vision care.